Book the Top Vacation Rentals in Truckee CA! Nestled just a short drive northwest of one of America’s largest and deepest alpine lakes, the town of Truckee provides visitors with a unique and exciting experience away from the business of the Lake Tahoe area. 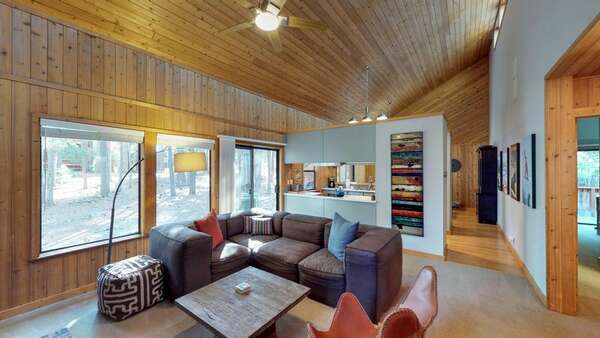 The tranquil ambiance here is ideal for those trips where you just want to escape the hustle and bustle of everyday life and reconnect with nature in the peace and quiet of the mountains, which is why Tahoe Signature Properties offers a multitude of wonderful Truckee vacation rentals. Read on to learn more about what makes Truckee California such a great place to spend your vacation, or click below to rent the best vacation rentals in Truckee CA! Nestled in between California and Nevada, the pleasant and serene locale of Lake Tahoe has drawn in people seeking recreation, relaxation, and adventure for many generations. Here, you can gaze into the crystal-clear depths of America’s biggest alpine lake—as well as its second-deepest lake overall—while partaking in fun-filled recreation all year long. Race down the fluffy, white mountain slopes or take an invigorating trek through the snow-covered pines in the winter. In the spring and summer, hit the water by boat for huge catches of trout and salmon, or for exhilarating jet skiing sessions. No matter what season you decide to plan your stay in one of our vacation rentals in Truckee CA, we guarantee that you’ll never run short of things to do and see during your visit here! Browse below to find the perfect vacation rentals Lake Tahoe has to offer including Truckee Regional Park for your getaway! Tahoe Signature Properties has the esteemed privilege of offering only the highest-quality vacation lodgings in the entire North Tahoe and Truckee area inclduding Truckee River Regional Park. Our luxurious Lake Tahoe vacation rentals are fully-furnished with lavish amenities and cozy touches, in addition to being kept immaculately clean and in excellent repair so that when you arrive, all you need to think about is what you’ll do next on your vacation! Additionally, we provide professional-grade property management services such as cleaning, maintenance, and marketing to owners of vacation properties all throughout the region. Stella is located in the Cedar House Sport Hotel near Truckee and offers an award-winning menu by chef Jacob Burton. Stella’s menu features many items from the Cedar House Hotel’s gardens and incorporates simple ingredients that make for comforting and inviting dishes. Chef Jacob Burton worked at the Lone Eagle Grille and the Big Water Grille, both in Lake Tahoe, before coming to the Cedar House. His menu includes appetizers such as Pan Seared Diver Scallops, Popcorn Polenta and Roasted Mushrooms on a micro green salad, entrees such as Roasted Salmon with Crispy Yucca or Colorado Lam with Fingerling Potatoes. Desserts include Marscapone Cheese Cake with Madrone Bark Syrup. A stellar wine list is included as well as after dinner drinks. Rated one of the best burger places in Lake Tahoe Area and featured on the Food Network’s “Diners, Drive-Ins and Dives,” Burger Me is located in the old town section of Truckee in a former auto repair shop. The space is perfect for families and children and full of color. Their burgers are made with all-natural ingredients. No growth hormones or chemicals in these beauties! The burgers and drinks are served in corn-based packaging and everything is recyclable. The refurbished building with retro styling is great to hang out in, but you can also get your burger to go and eat outside in the fresh mountain air. Eat indoors or on the restaurant’s beautiful patio. They have all kinds of dishes to seduce your taste buds. Choose between crispy Baby Back Ribs grilled with jerk spice, and served with house made barbecue sauce or Jerk-spiced Fried Rock Prawns with Cajun tartar sauce. Order a Braised Free-Range Rabbit Cassoulet with Andouille sausage, garlic, rosemary and white beans, or simply opt for a Cheeseburger with waffle fries. Here, the wine and beer lists are extensive. The Cottonwood is filled with skiing and railroad memorabilia from Truckee’s days as a railroad town, this casual restaurant, bar, and lounge provides customers with great views of Truckee, charming ambiance, and lovingly-prepared Californian-American fare. Begin planning the vacation of a lifetime when you contact our dedicated in-office team of reservation specialists to learn more about the fantastic vacation rentals in Truckee CA and North Lake Tahoe that we have available for your stay, including Truckee Parks or talk to our friendly property management specialists for additional information on the property management services that Tahoe Signature Properties supplies to our homeowners to help them make the most out of their Lake Tahoe rentals investment. Call or email us today! Not only are these high-quality Truckee Vacation Rentals replete with space, privacy, and luxurious amenities, but they also provide guests with the added benefit of being located mere minutes away from attractions and activities all over Lake Tahoe and Truckee. When you stay in one of these lovely Truckee lodging options in this Old West-inspired area, you have immediate access to a bevy of recreational opportunities year-round. Nationally-recognized restaurants like Moody’s Bistro, quaint dive clubs like Pastime Club and high-end wine bars like Avec Wine Bar, and handcrafted souvenirs at Artisans Marketplace add to this town’s charming alpine character all year long. Extensive trails for hiking and biking, exquisite state parks with gorgeous natural sights, the glistening waters of Donner Lake, and the thrills of rafting on Truckee River are all ideal activities in the spring and summer months, when the lush forest greenery, temperate climate, and beautiful wildflowers come to life all over the region. And all are open to you when you stay at one of our amazing Truckee vacation rentals! During the colder season, the snowy historic downtown Truckee becomes lit with the warm glow of twinkling lights, making for a romantic and picturesque stroll fit for a holiday movie or postcard. Traditional heart-pounding sports like skiing and snowboarding are also a popular pastime when winter makes its arrival known with a fluffy blanket of snow. No matter what time of year you decide to visit, we guarantee that you’ll enjoy all that Truckee has to offer! And you’ll love our Truckee Vacation Rentals even more! Plan Your Alpine Excursion At our Vacation Rentals in Truckee CA Today! Truckee and Lake Tahoe share an idyllic natural setting that brings vacationers the true mountainside experience of a lifetime. Contact our reservations team to reserve your stay in one of our amazing vacation rentals in Truckee CA today!